For more information about this Proven Safety Countermeasure, visit the Office of Safety's Safety EdgeSM website. Source: Safety Effects of the SafetyEdgeSM, FHWA-SA-17-044. 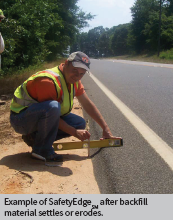 SafetyEdgeSM technology shapes the edge of the pavement at approximately 30 degrees from the pavement cross slope during the paving process. This systemic safety treatment eliminates the vertical drop-off at the pavement edge, allowing drifting vehicles to return to the pavement safely. It has minimal effect on asphalt pavement project cost with the potential to improve pavement life. Vehicles may leave the roadway for various reasons, ranging from distracted driver errors to low visibility, or to the presence of an animal on the road. Exposed vertical pavement edges can cause vehicles to be unstable and prevent their safe return to the roadway. SafetyEdgeSM gives drivers the opportunity to return to the roadway while maintaining control of their vehicles. For both SafetyEdgeSM and traditional edge, agencies should bring the adjacent shoulder or slope flush with the top of the pavement. Since over time the edge may become exposed due to settling, erosion, and tire wear, the gentle slope provided by SafetyEdgeSM is preferred versus the traditional vertical pavement edge. 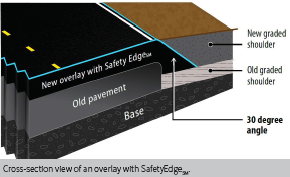 Transportation agencies should develop standards for implementing SafetyEdgeSM on all new asphalt paving and resurfacing projects where curbs are not present, while encouraging standard application for concrete pavements.